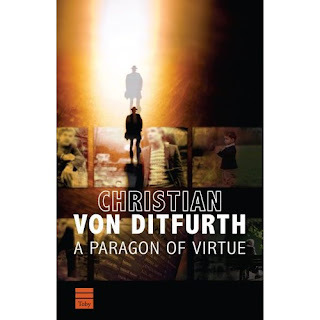 A Paragon of Virtue, Christian von Ditfurth's 2002 novel set mostly in Hamburg (published in English by Toby Press in 2008) has all the elements of a cozy. It's set in academic circles (the main character, Josef Stachelman, is a historian). Stachelmann, who can't seem to finish his the research that will gain him tenure in the German academic system, becomes an amateur detective when his friend Ossi, a detective in Hamburg's homicide division, asks him for help in a strange case: a prominent real estate magnate is being attacked for reasons unknown--so far his wife and two of his three children have been murdered. 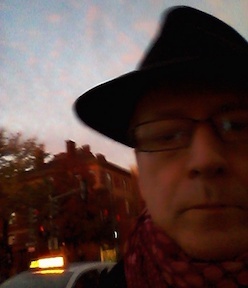 The hapless academic, who's having trouble with a female student who is coming on to him (to get the grade she needs) as well as having constant worries about his lack of progress on his own book and recurring problems with rheumatoid arthritis, is recognizable as an almost stock character of the cozy (of the amateur detective variety). But Stachelmann's academic subject is the Holocaust, and he begins to suspect that the murders lead back to the German politics, bureaucracy, and police of the Nazi era. Ossi stops listening to him (after a colleague of his is run over, perhaps murdered, right in front of him) and Stachelmann goes off on his own (with the occasional help of an attractive female colleague). The conflict between the cozy/mystery format and the awful events of both past and present (and the greed and lies of the past and present) keeps the book interesting for readers disposed toward both lighter and darker realms of crime fiction. The narrative alternates among Stachelmann, Ossi, and a murderous old man, all in the third person but hewing closely to the point of view of those three. Stachelmann's portion of the narrative is lively and believable, revealing much about German academic life, Nazi and contemporary bureaucracy, the archives of a reunited Germany, and the horrors of the Holocaust, and the old man's narrative is chilling. The police narrative, carried forward mostly in dialogue among the detectives, lacks a convincing vernacular language, and the police go back and forth from the real estate magnate/victim and several of his associates without making much progress. But Ossi is likable, and both his murdered colleague and the female detective who replaces her are interesting characters with lively voices, not intimidated by the male-dominated climate of the police force. As you might guess, the story is more ruminative than action-oriented, though there are several short eplisodes of action and suspense, especially in the later part of the novel. There is, though, a pervading atmosphere of anguish and threat (not so much on the husband-father-victim's part but among all the other characters) and Stachelmann is forced to confront his own family's part in the horrors of his parents' generation. A Paragon of Virtue is evidently the first novel in a series based on Stachelmann's character, though none of the others has been (or is projected to be, at this point) translated. Less hard-boiled than the Kayankaya novels of Jakob Arjouni and more distanced from the war than Philip Kerr's Berlin Noir series, von Ditfurth has carved out a particular niche in German crime fiction (or crime fiction set in Germany), oscillating between the country's past and present. It would be interesting to know whether the later novels follow that pattern as well, and how well Stachelmann and Ossi hold up as running characters--if anyone is familiar with the later books, please let us know. I found the plot line in this book remarkably similar to Jo Nesbo's The Redbreast which I enjoyed more. I'm wondering which came first and whether either of them knew about the other. Anon, interesting observation. I didn't think so at the time, but you do have a point. Will check the dates. This book did remind me of Craig Russell, to some extent - the detective there is a former history student who ended up as a policeman due to various personal traumas. I think German crime fiction is really underrated - I wonder why it's never quite caught on in the same way novels from further north have. Is WW2 still a factor? It certainly still seems to be present in a disproportionate number of novels, even if the connection to current crimes is becoming increasingly implausible. Perhaps 'decline of the welfare state' doesn't sell as well - though it's more accurate - if you didn't have a rosy view of the country to begin with.